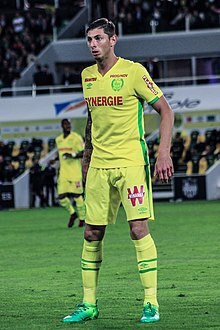 Emiliano Raúl Sala Taffarel (Spanish pronunciation: ; 31 October 1990 – 21 January 2019) was an Argentine professional footballer who played as a forward. After playing youth football in Argentina and following a short spell in Portugal's regional leagues, Sala began his professional career in France with Bordeaux, making his professional debut in February 2012. After struggling to break into the first team, he was loaned out to Championnat National side Orléans and Ligue 2 side Niort in consecutive seasons. He enjoyed prolific spells with both clubs, scoring 39 goals between them, before returning to Bordeaux. After initially being promised an increased role after his successful loans, Sala fell out of favour again, and instead, joined fellow Ligue 1 side Caen on loan. Unable to establish himself in the first team, Bordeaux hoped to loan Sala out in order to gain experience and he was expected to sign for a team in Spain before his agent rejected the move, wanting Sala to remain in France. He instead joined Championnat National side US Orléans on loan after being spotted by manager Oliver Frapolli a year previously. Frapolli described Sala as "the best player on the team, without question", as he went on to score nineteen goals for the club in 37 appearances. He helped the club to an eighth place finish in the Championnat National. Sala's good form saw him as the joint-highest goalscorer in Ligue 1 at the start of December, his tally of twelve goals tied with Paris Saint-Germain's Kylian Mbappé.On 5 December, Sala scored his last goal for the club in a 3–2 Ligue 1 home victory over Olympique de Marseille. On 16 January 2019, he played his final match for the club in a 1–0 Ligue 1 away defeat against Nîmes Olympique. After completing his medical at Cardiff, Sala returned to Nantes on the morning of 19 January on a plane arranged by football agent Mark McKay. His intention was to return to Cardiff on 21 January in order to attend his first training session with his new club the following morning. Sala had been invited to attend Cardiff's match against Newcastle United by manager Neil Warnock, but he returned to France to say goodbye to his Nantes teammates and collect personal belongings. On 3 February, another underwater search for the aircraft began, using the AAIB's Geo Ocean III vessel and a privately-funded vessel, which were conducting sonar surveys of the seabed. The planned search, lasting three days, would cover an area of 4 square nautical miles (14 km2; 5.3 sq mi), about 24 nautical miles (44 km; 28 mi) north of Guernsey. At approximately 21:11 GMT, six hours after the new search began, wreckage from the aircraft was found at a depth of 63 metres (207 ft). On 4 February, investigators stated that there was one body visible inside the wreckage. 1 2 3 4 5 6 "E. Sala". Soccerway. Retrieved 4 January 2019. 1 2 3 ""It's hopeless, you can't believe": Emiliano Sala father after the disappearance of the flight". vaaju.com. 22 January 2019. Retrieved 22 January 2019. ↑ "Emiliano Sala feared dead: desperate hunt for missing plane with Cardiff City's new £15m striker on board called off for the night". London Evening Standard. 22 January 2019. Retrieved 22 January 2019. 1 2 3 Bories, Flavien (5 March 2017). "Emiliano Sala: Quand je Veux Quelque Chose je Me Bats". sofoot.com (in French). Retrieved 22 January 2019. ↑ Furlone, Aquiles (22 January 2019). "Darío, hermano de Sala: "Lo único que ha hecho toda su vida es estar con la pelota" (in Spanish). Mundo Deportivo. Retrieved 23 January 2019. 1 2 "Todo el pueblo francés está en shock" (in Spanish). Olé. 27 November 2015. Retrieved 26 January 2019. 1 2 Bougis, Axel (14 February 2014). "Sala: J'ai Beaucoup Regarde Batistuta". sofoot.com (in French). Retrieved 22 January 2019. 1 2 3 "Joven futbolista de Progreso tiene su destino en España" (in Spanish). El Santafesino. 9 September 2007. Retrieved 22 January 2019. 1 2 "Emiliano Sala jugará en la Premier League de Inglaterra" (in Spanish). Diaxdia. 21 January 2019. Retrieved 22 January 2019. ↑ "Partidos - 2007-2008 - EMILIANO R SALA" (in Spanish). Punto Balon Balear. Retrieved 9 February 2019. ↑ "Partidos - 2007-2008 - EMILIANO RAUL SALA" (in Spanish). Punto Balon Balear. Retrieved 9 February 2019. ↑ "Jogador argentino desaparecido em avião começou a carreira no Crato" (in Portuguese). Record. 22 January 2019. Retrieved 23 January 2019. ↑ "Quem é Emiliano Sala, contratação mais cara do Cardiff que está desaparecida em voo?" (in Portuguese). Globoesporte. 22 January 2019. Retrieved 23 January 2019. 1 2 3 Baron, Jeramie (4 March 2018). "Comment Emiliano Sala (Nantes) s'est fait un nom dans les divisions inférieures avant de briller en Ligue 1" (in French). France Football. Retrieved 22 January 2019. 1 2 Moore, Steven (21 November 2018). "Emiliano Sala: From Serie C Reject to Ligue 1 Top Scorer". Breaking the Lines. Retrieved 22 January 2019. 1 2 3 White, Adam (22 January 2019). "Emiliano Sala, the humble forward who enriched everyone's lives". The Guardian. Retrieved 22 January 2019. ↑ "Lyon vs. Bordeaux - Football Match Summary - February 8, 2012 - ESPN". ESPN.com. Retrieved 3 February 2019. ↑ "Emiliano Sala". FootballDatabase.eu. Retrieved 2 July 2013. 1 2 Rostac, Matthieu (27 February 2015). "Emiliano Sala: Pret du But". sofoot.com (in French). Retrieved 22 January 2019. ↑ Chochois, Alexandre (2 July 2013). "Niort: Un buteur de Bordeaux débarque en prêt (off.)" [Niort: Bordeaux striker arrives on loan (official)] (in French). foot-national.com. Retrieved 2 July 2013. ↑ "BORDEAUX : SALA PROLONGE DE DEUX ANS". mercato365.com. 3 July 2014. Retrieved 27 January 2019. 1 2 "Emiliano Sala, Un Atout Supplementaire Pour Le Maintien" (in French). SM Caen. 28 January 2015. Retrieved 22 January 2019. ↑ "Emiliano Sala, un atout supplémentaire pour le maintien" (in French). smcaen.fr. 28 January 2015. Retrieved 29 January 2015. ↑ "Nantes make Sala a canary". Yahoo Sports. 20 July 2015. Retrieved 15 May 2017. 1 2 3 White, Adam; Devin, Eric (5 November 2018). "The most prolific Argentinian striker in Europe this season? Emiliano Sala". The Guardian. Retrieved 22 January 2019. ↑ Aarons, Ed (22 January 2016). "Nantes reject £3m bid from Wolves for forward Emiliano Sala". The Guardian. Retrieved 23 January 2019. ↑ Dupont, Régis (20 October 2017). "Emiliano Sala cut for the fight". L'Equipe (in French). Retrieved 27 January 2019. 1 2 Yew, Oliver (25 January 2019). "In Profile: Emiliano Sala". Sky Sports. Retrieved 27 January 2019. ↑ "Sala hits three as Nantes crush Toulouse". www.ligue1.com. 20 October 2018. ↑ "Ligue 1: Emiliano Sala voted best player of the month of October". L'Equipe (in French). 12 November 2018. Retrieved 27 January 2019. ↑ "Emiliano Sala revient sur Kylian Mbappé : le classement dynamique des buteurs de Ligue 1 après la 16e journée". L'Equipe (in French). 5 December 2018. Retrieved 27 January 2019. ↑ "Emiliano Sala: Cardiff City sign Nantes striker for undisclosed club-record fee". BBC Sport. 19 January 2019. Retrieved 22 January 2019. ↑ Abbandonato, Paul (19 January 2019). "Cardiff City announce signing of goal ace Emiliano Sala in club record £15m deal". WalesOnline. Media Wales. Retrieved 19 January 2019. ↑ "Disparitiom D'Emiliano Sala : Bordeaux Dement Avoir Reclame De L'Argent À Nantes". football365.fr (in French). 27 January 2019. Retrieved 27 January 2019. ↑ Abbandonato, Paul (19 January 2019). "Cardiff City £15m 'capture' Emiliano Sala rejects huge 11th hour Chinese offer – French reports". WalesOnline. Media Wales. Retrieved 22 January 2019. ↑ "Emiliano Sala: Nantes demand transfer fee from Cardiff City". 6 February 2019 – via www.bbc.co.uk. 1 2 Booth, Dominic (24 January 2019). "Who is football agent Mark McKay, his relationship with Emiliano Sala, Cardiff City and his academy twin brothers?". WalesOnline. Media Wales. Retrieved 25 January 2019. ↑ James, Stuart (23 January 2019). "'Subdued' Cardiff City players train as Emiliano Sala dominates thoughts". The Guardian. Retrieved 25 January 2019. 1 2 Morris, Steven (28 January 2019). "Emiliano Sala's family hire submarine to hunt for missing plane". The Guardian. Retrieved 29 January 2019. 1 2 Lewis, Anna (26 January 2019). "Inside the search for Emiliano Sala: What happened during three grueling days that ended in vain". WalesOnline. Media Wales. Retrieved 26 January 2019. ↑ "Emiliano Sala's audio message from plane". Sky Sports. Retrieved 23 January 2019. Translation is from the Sky Sports article. ↑ Parveen, Nazia; Morris, Steven (25 January 2019). "Emiliano Sala pilot's friends 'surprised' he took night flight" – via www.theguardian.com. ↑ "Emiliano Sala: search for footballer and pilot called off". The Guardian. 24 January 2019. ISSN 0261-3077. Retrieved 24 January 2019. 1 2 "Emiliano Sala: Argentina president backs new search for footballer". BBC News. 25 January 2019. Retrieved 26 January 2019. ↑ Farrell-Roig, Estel (25 January 2019). "Emiliano Sala's family to organise for private search boats and divers to find missing Cardiff City footballer". WalesOnline. Media Wales. Retrieved 26 January 2019. 1 2 "Emiliano Sala search: Footballer's family thanks donors". BBC News. 27 January 2019. Retrieved 27 January 2019. ↑ Doel, Jon; Sands, Katie (26 January 2019). "Live updates as new Emiliano Sala search launched following remarkable fundraising campaign". WalesOnline. Media Wales. Retrieved 27 January 2019. ↑ McGeehan, Matt (29 January 2019). "Arsenal remember Emiliano Sala with touching programme tribute to missing Cardiff striker". Evening Standard. Retrieved 29 January 2019. ↑ Sands, Katie; Walford, Jessica (30 January 2019). "Parts of missing plane carrying Emiliano Sala and pilot found on beach". WalesOnline. Media Wales. Retrieved 30 January 2019. ↑ "Sala plane wreckage found in Channel". 3 February 2019. Retrieved 3 February 2019. ↑ Weaver, Matthew (4 February 2019). "Emiliano Sala's 'body could be found among plane wreckage'". The Guardian. ↑ "'One occupant visible' in Emiliano Sala plane wreckage - investigators". Sky News. Retrieved 5 February 2019. ↑ "Emiliano Sala crash: fuselage of plane with one body on still on board pictured on seabed". MSN. Retrieved 5 February 2019. ↑ "Emiliano Sala search team recover body from plane wreckage". BBC News. 7 February 2019. ↑ Mercer, David; Taylor, Rebecca (7 February 2019). "Emiliano Sala search: Body recovered lands in Dorset". Sky News. Retrieved 7 February 2019. ↑ "Body recovered from plane which crashed into English Channel confirmed as footballer Emiliano Sala". ITV News. 7 February 2019. Retrieved 7 February 2019. 1 2 Doel, Jon; Booth, Dominic (11 February 2019). "Live updates as inquest into Emiliano Sala's death adjourned". WalesOnline. Media Wales. Retrieved 11 February 2019. ↑ Burton, Chris (8 February 2019). "Nantes to retire No.9 shirt in honour of Emiliano Sala as they pay emotional tribute to their former striker". Goal.com. ↑ "Emiliano Sala's funeral held in Argentina". CNN. 16 February 2019. Retrieved 17 February 2019. ↑ "AAIB Bulletin S1/2019 SPECIAL" (PDF). assets.publishing.service.gov.uk. 25 February 2019. Retrieved 25 February 2019. ↑ Bielderman, Erik (22 January 2019). "Emiliano Sala: Profile of 'a South American warrior' & the 'local Carlos Tevez". BBC Sport. Retrieved 22 January 2019. 1 2 Yew, Oli (23 January 2019). "In profile: How hard work helped Emiliano Sala become Nantes hero and earn Premier League transfer". Sky Sports. Retrieved 23 January 2019. ↑ Morgan, Tom (22 January 2019). "Emiliano Sala: Who is Cardiff's £15m record signing?". The Daily Telegraph. Retrieved 22 January 2019.